More coins - more fun! This pack is the ideal supplement to your game of choice. Increasing your fantasy funds can add depth to game play and open up the possibilities for new adventures! Pack contains 30 Dwarven coins, 10 each of Gold, Silver and Copper, all in the usual high quality you expect from Fantasy Coin, LLC. The gold and silver coins measure 30mm x 2.5mm, the copper 25mm x 2mm. 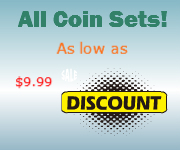 All coins are struck from high quality zinc, electroplated with colored nickel and coated with an antique finish. Our coins look, feel and even sound as if they've come directly out of a fantasy realm! Great coins! 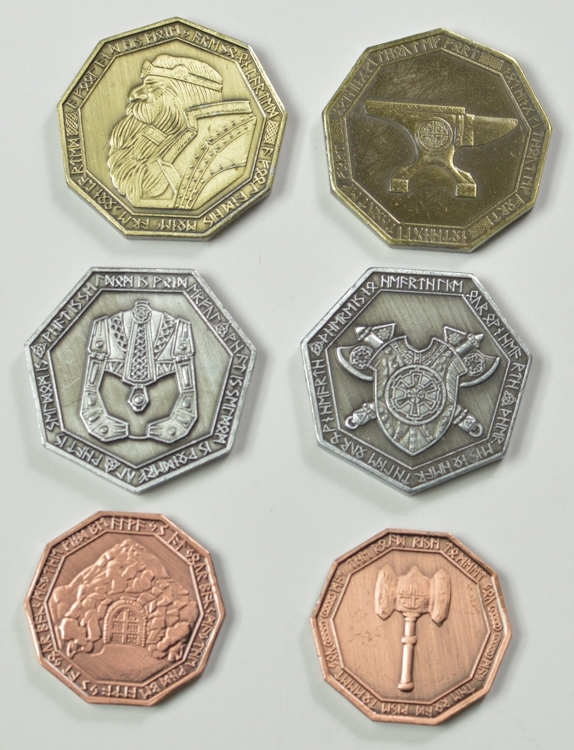 These coins are perfect for a dwarf themed setting of any type. They've got great weight and look fantastical, but not too gaudy or silly. The only issue I've had is that some of them weren't stamped all that great so some detail on runes or such was smooshed/unclear, but it's not exactly noticeable and kind of makes them look a littlemor worn. still a great product and I'm considering buying another 10 packs or so!